BACKGROUND: The clinical value of hydration therapy using sodium bicarbonate in the prevention of contrast media-induced nephropathy is subject of controversy. OBJECTIVE: This meta-analysis of randomized clinical trials was performed to determine whether hydration therapy using sodium bicarbonate consistently differs from control hydration regimens with normal saline in its preventive effects upon radiocontrast media-induced renal dysfunction. METHODS: Randomized clinical trials comparing sodium bicarbonate with a control regimen for prevention of contrast media-induced nephropathy were selected by multiple methods, including computer searches of bibliographic databases, perusal of reference lists, and manual searching. Major findings were qualitatively summarized. In addition, a quantitative meta-analysis was performed on renal dysfunction data. RESULTS: Altogether, 9 randomized clinical trials with a total of 2,043 patients were included. The pooled odds ratio was 0.45 (confidence interval, 0.26–0.79), indicating a significant treatment benefit of sodium bicarbonate compared to normal saline. Heterogeneity was detectable (p = 0.016) and evidence of publication bias was present (p = 0.012). After adjustment for presumed unpublished trials after trim-and-fill analysis, the estimated pooled odds ratio was 0.65 (confidence interval, 0.36–1.20). CONCLUSION: This meta-analysis confirms that, based on currently available randomized trials, bicarbonate therapy is effective in preventing contrast media-induced nephropathy. However, study heterogeneity and publication bias are substantial, and therefore further controlled clinical trials are needed. HINTERGRUND: Der klinische Nutzen der Hydrierung mit Natiumbikarbonat in der Prävention der kontrastmittelinduzierten Nephropathie ist bislang nicht eindeutig belegt. ZIEL: Diese Meta-Analyse randomisierter klinischer Studien wurde durchgeführt um zu untersuchen, ob eine Hydrierung mit isotonem Natriumbikarbonat einen Vorteil gegenüber der Standardbehandlung mit isotonem Kochsalz zur Prävention der Kontrastmittelnephropathie darstellt. 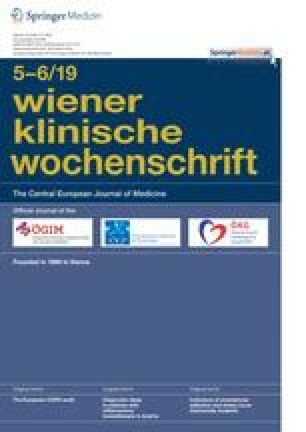 METHODEN: Randomisierte klinische Studien, welche Natriumbikarbonat gegen herkömmliche Hydrierung mit isotonem Kochsalz in Hinblick auf Prävention von kontrastmittelinduzierter Nephropathie vergleichen, wurden mittels multipler Computersuche, bibliographischer Datenbanken, Prüfung von Referenzlisten und manueller Nachforschung identifiziert. Die Hauptaussagen wurden qualitativ ausgewertet. Daten zur Kontrastmittelnephropathie wurden quantitativ analysiert. ERGEBNISSE: Insgesamt wurden 9 randomisierte klinische Studien mit insgesamt 2,043 Patienten eingeschlossen. Die gepoolte "Odds-ratio" betrug 0,45 (Konfidenzintervall, 0,26–0,79) und zeigte somit einen signifikanten Behandlungsvorteil von Natriumbikarbonat. Sowohl Heterogenität (p = 0,016) als auch Publikations-Bias (p = 0,012) konnten nachgewiesen werden. Nach Adaptierung für mutmaßlich unveröffentlichte Studien mittels "Trim-and-fill" Analyse, ergab sich eine geschätzte gepoolte "Odds-ratio" von 0,65 (Konfidenzintervall, 0,36–1,20). ZUSAMMENFASSUNG: Diese Meta-Analyse bestätigt die Effektivität von Bikarbonat in der Prävention der kontrastmittelinduzierten Nephropathie. Wegen der Studieninhomogenität und des Publikationsbias sind jedoch weitere klinische Untersuchungen zur Absicherung dieses Ergebnisses erforderlich.